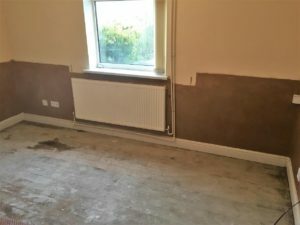 The job was identified as a standard rising damp issue, so we marked out the walls in question to an height of 1 metre and removed the old skirting boards plus two old radiators. From start to finish the project took 4 full working days to complete. 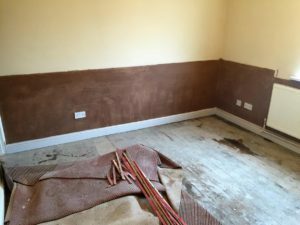 The plaster was chopped off back to the original brick on the walls marked out then a chemical DPC was then supplied and installed. We then re plastered the walls with a two coat salt retardant render and skimmed to completion. 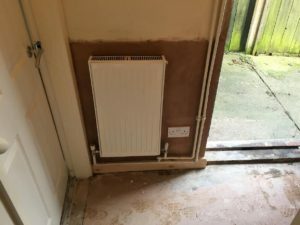 We then supplied and fitted new skirting boards and re fitted the radiators. Finally we finished off by cleaning down and removing all our waste from site.